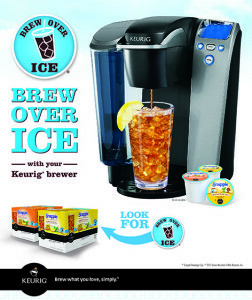 Brew Over Ice Review and $2 Off Coupon | A Savings WOW! If you were out and about in the Chicago-area today, you may have felt like melting with the above-normal temperatures we were having today. You know what would have made it feel better? If you had a Brew Over Ice drink made straight from your Keurig brewer. We were given the chance to try out a few of the flavors and loved how easy it is to make these and how delicious they are. All you need to do is fill a cup with ice and brew these like you normally would in a Keurig Brewer. Make sure to try some yourself. Save $2 on your purchase of Brew Over Ice products when you download this coupon and watch a video. Disclosure: We received samples to review this product. However, all opinions are our own honest opinions. Please see our disclosure policy for more information.